With a growing family of three children and nine grandchildren, I am more than ever convinced that my generation is leaving our future generations with problems which, on a best case scenario, will be very difficult to solve. More pessimistically, I believe we could be leaving a legacy of problems which the inheritors of the Earth will be unable to solve because these particular problems will not be solvable. In the book’s final section, Sleepwalking to Armageddon, he takes an uncompromising look at what he considers to be the four formidable challenges facing humanity in the 21st century: climate change, population increase, depletion of natural resources and – the likely consequence of those first three – social and economic breakdown. For Jim Whyte (a former marine engineer and Scottish ship owner who co-founded the liquid gas shipping company LGE) the 1968 Club of Rome provided prophetic evidence for an increasingly pessimistic world view. Here Sceptical Scot publishes an extract from Sleepwalking To Armageddon with its timely reminder that – whatever the outcome of Brexit – climate change and the other great world problems will not stop at politically defined borders. Back in April 1968, a group of thirty individuals from ten different countries – scientists, educators, economists, humanists, industrialists and civil servants – gathered in the Academia dei Leinci in Rome. The group, which became known as the Club of Rome met at the instigation of Italian industrialist Aurelio Peccei and Scottish scientist Alexander King. Working with the Massachusetts Institute of Technology (MIT) they embarked on an ambitious undertaking which they called the Project on the Predicament of Mankind. 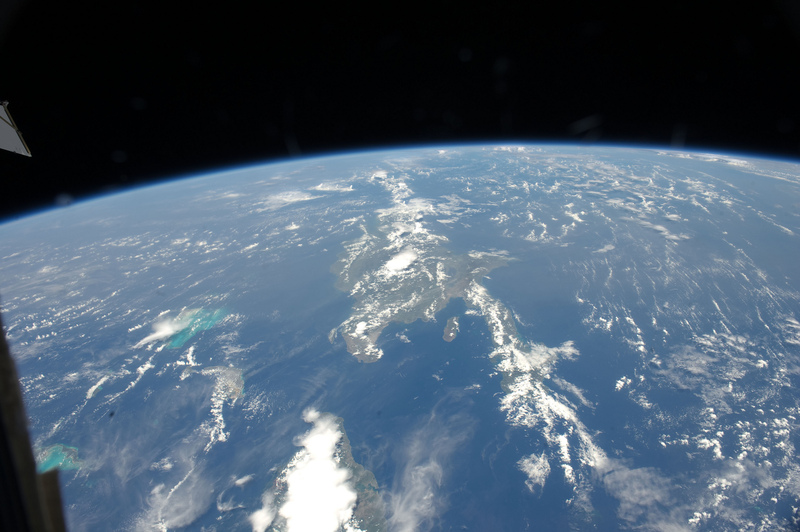 The study group used an MIT model which they named World 3, a computer simulation of the interactions between population, industrial growth, food production, depletion of non-renewable resources and limits in Earth’s ecosystems. The aim was to examine the complex problems which trouble and effect people of all nations and societies: poverty in the midst of plenty; degradation of the environment; loss of faith in institutions; uncontrolled urban spread; insecurity of employment; alienation of youth; rejection of traditional values; and inflation and other monetary and economic disruptions. To the Club of Rome these seemingly divergent problems have three characteristics in common: they occur to some degree in all societies; they contain technical, social, economic and political elements; and, most important of all, each of them interacts with the others. In March 1972, the Club of Rome published their highly influential study, The Limits to Growth, which pointed out that a global economy based on the fantasy of perpetual exponential growth would, sometime in the early part of the twenty-first century, inevitably collide disastrously with the hard facts of life in a world of finite resources. Put simply, the group demonstrated that we were living beyond the means of the planet on which all of us rely for our very survival. I do not wish to be overdramatic, but I can only conclude from the information that is available to me as Secretary General, that the members of the United Nations have perhaps ten years left in which to subordinate their ancient quarrels and launch a global partnership to curb the arms race, to improve the human environment, to defuse the population explosion and to supply the required momentum to development efforts. If such a global partnership is not forged within the next decade, then I very much fear that the problems which I have mentioned will have reached such staggering proportions that they will be beyond our capacity to control. Remember that these words were spoken back in 1969. As I write this almost 50 years later we know that the necessary partnerships were never forged, the steps were not taken, and the consequences are now arriving bang on schedule.We also have the additional hazard of Global Warming, which was not considered to be a problem back in 1970 but which has now developed into a major threat to human life on Earth. As predicted, the problems now are certainly of such staggering proportions that just as U Thant warned back in 1969, I and others believe it is now probably beyond our capacity to control them. If that is the case, the collapse of our, industrial civilisation when it comes, will this time result in a global collapse. It is no longer possible for any individual nation to collapse in isolation. Our closely integrated global systems will simply disintegrate. That seems clear to me, but sadly there is still a very limited number of people who are prepared to acknowledge this danger. It is likely that the survival of human society, will depend on the speed and effectiveness with which people, and particularly politicians now respond to these issues. The belief that exponential economic growth can go on ad infinitum is now hardwired into most of our brains and all of our cultures. As a species, Homo sapiens appears to be sleepwalking into an economic, social, and population nightmare. Business as usual is quite simply no longer an option. This is not a proclamation from some doomsday cult, but rather the considered opinion of many of the most highly respected and well paid scientists, geologists, economists and physicists in the world today. These are rational, professional, conservative individuals who are convinced that our industrial civilisation is now about to begin, or has perhaps already begun, its long descent. Those of us who have lived through the last eighty odd years of almost uninterrupted growth must now accept that our brief but miraculous sojourn in paradise is coming to an end, and as the financial elements of our industrial civilization – interest rates, pension funds, insurance, stock markets, etc are all dependant and predicated on Exponential Economic Growth – the social and economic consequences of the decline will I’m sure be cataclysmic. 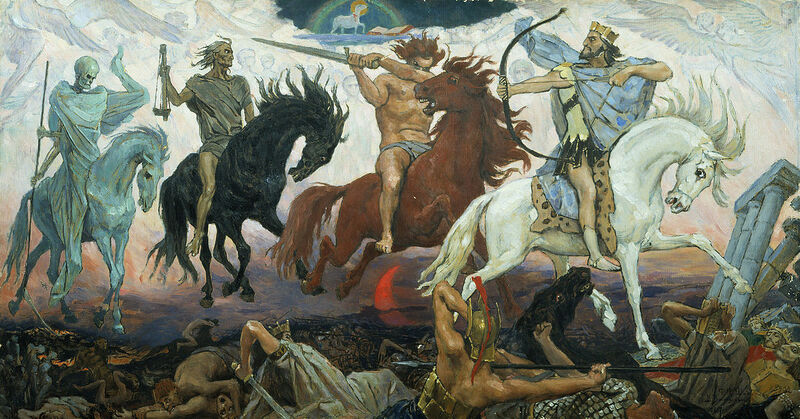 The Four Horsemen of the Apocalypse, War, Famine, Pestilence and Death have been replaced and should now read: Depletion of Non-renewable Resources, Population Increase, Global Warming and finally, Social and Economic Breakdown of our Society, with each of these Horsemen interacting with the others. Featured image: Four Horsemen of the Apocalypse – Death, Famine, War, and Pestilence, an 1887 painting by Viktor Vasnetsov who died in 1926. A Letter to My Grandchildren published in 2016 is available as an e-book HERE. Printed copies are also held in the National Library of Scotland and Edinburgh and Scottish Collection of Edinburgh Central Library. It’s astonishing that someone could still cite the Club of Rome as if its prophecies had any more merit than those of Nostradamus, or Malthus. In every respect they’ve been falsified: the percentage of people living in poverty has fallen dramatically, despite a big rise in population, and those people are healthier than ever before. Nor has the world run out of food or resources, despite that rise, partly because of “techno-fix” after techno-fix. Mr Whyte would no doubt have sneered at the invention of the computer. And as for newfangled nonsense such as robotics….. I suggest that Mr Whyte has a look at easily accessible work of the (sadly) late Hans Rosling. However, it’s apparent that some people are determined pessimists and, pace Mr Whyte, doom merchants who are impervious to evidence. There is a thoughtful counterpoint to this story. Technology has a part to play but there is an urgent need to address our unsustainable use of resources and our heavy but increasingly inefficient pressure on farmland. It is worth reading the extract of Jim Whyte’s book along with Professor Ian Boyd’s scientific analysis of the hope and challenges posed by new developments of vertical farming: optimism charged with a sense of urgency.